It’s like Christmas came early today. I am so very happy with the work that was done today. I am 19 1/2 inches away from a subfloor. 19 1/2 inches. Even better, tomorrow I get to start working on my wall framing. I head back to work Tuesday and will be building on weekends from here on in. I am so glad I took the past 2 weeks off to start my build. 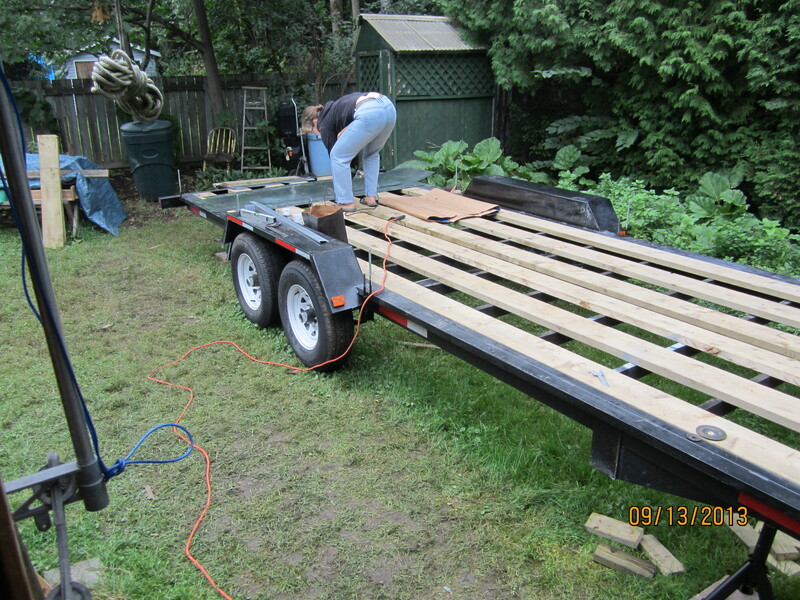 Friday morning , a welder came and welded on taller threaded rods onto my trailer. He was fast, and charged me less than what he had quoted. Yay! I got rods. The rest of the day was still spent working on flashing and we got held up by the rain. I had hoped to be a little further along by the end of the day, but then the rain came. 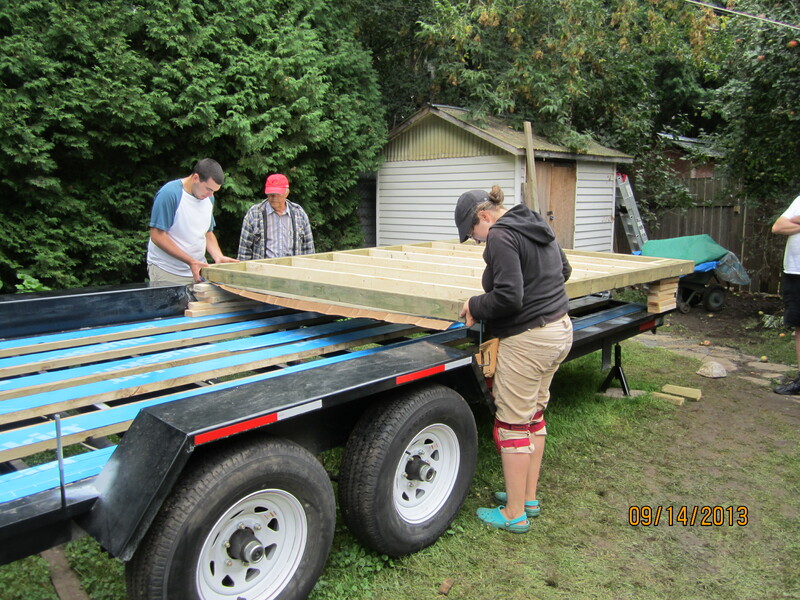 We wrangled one of my uncles and a couple of my cousins to come over and help us move some of the sections of the subfloor about, which they did help us do, but we weren’t able to do as much as we hoped because of the rain. Saturday was a day where a lot of work was done, but nothing really looked any different. 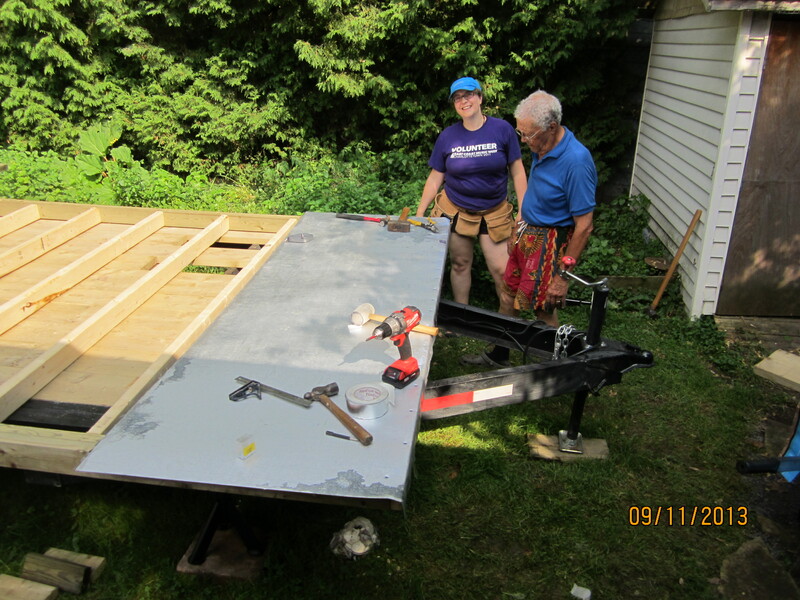 My uncle Phil and cousin Alex came back over and helped us move some of the subfloor sections as we needed some muscle. 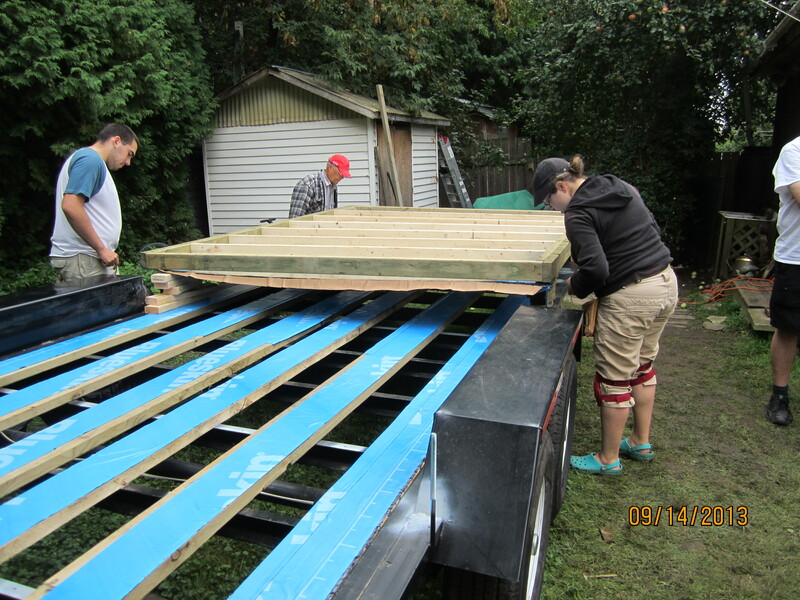 We also put down some more Blueskin on the pressure treated wood on the trailer. We got 2 sections in place, which with the new threaded rod was a bit of a challenge, figuring out where to drill holes and then having to re-drill holes when things didn’t line up quite as expected. 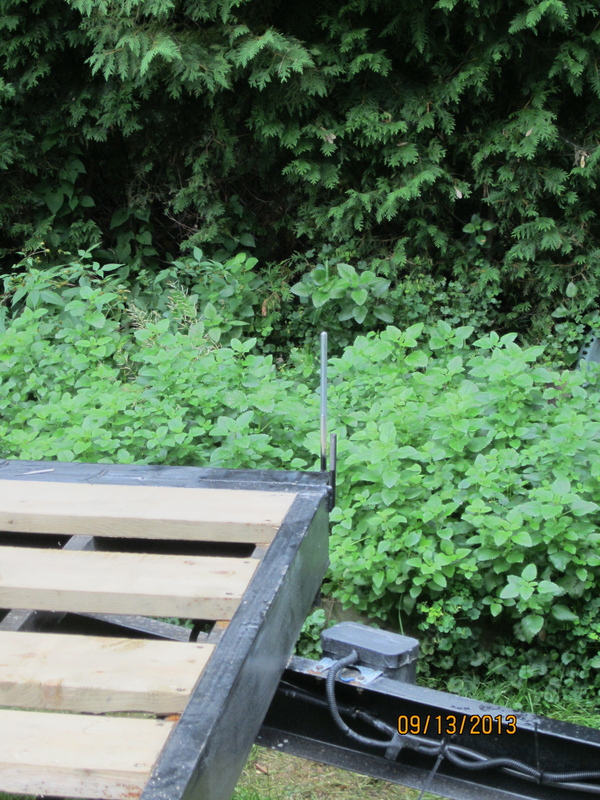 The third section was set up in place, raised up on blocks as we tried to line up the holes previously drilled and drill some new ones for the newly added rods. Throughout the process of this build, checking for square has been a regular part of the process. With the 3rd section of the subfloor up on blocks, we checked for square and the previously square structure was completely out of alignment. At the end of the day we had to leave the subfloor incomplete, unscrew the flashing on 2 sides of that section of subfloor and leave the section undone over night, while I went to a kegger at my brother & sister-in-law’s. It was a much-needed evening of laughter, good food, good beer and friends. When we were able to get to the construction this morning, we unscrewed a 3rd side of the flashing from that section, used a series of clamps to get the subfloor square and then screwed the flashing back on and got back to getting the holes lined up for the subfloor to fit over the threaded rods. My father was amazing as I found the process of getting everything lined up really frustrating. 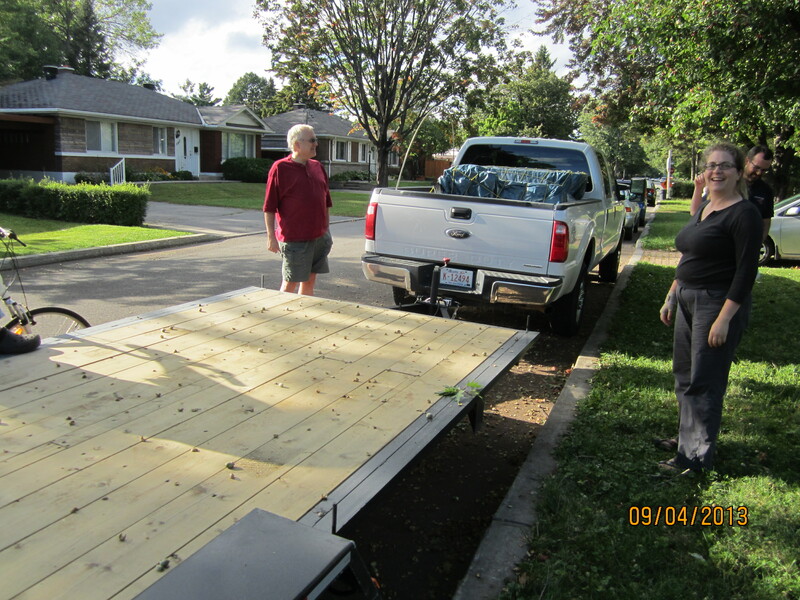 He was able to get the subfloor in place. Yay! 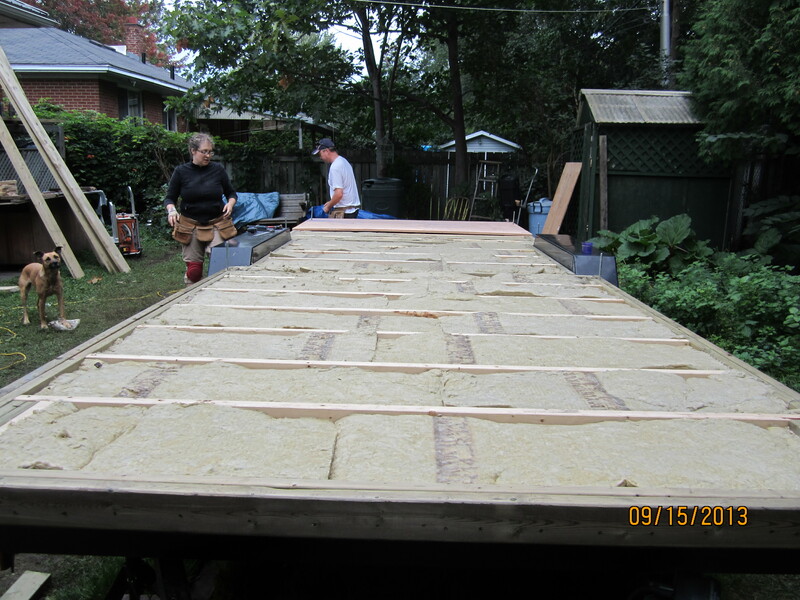 We started getting the insulation into the subfloor, a very quick and satisfying process of laying batts in the subfloor, when my neighbour Mike asked if he could lend a hand. Mike was my favourite person today. I did not realize that Mike used to build houses. 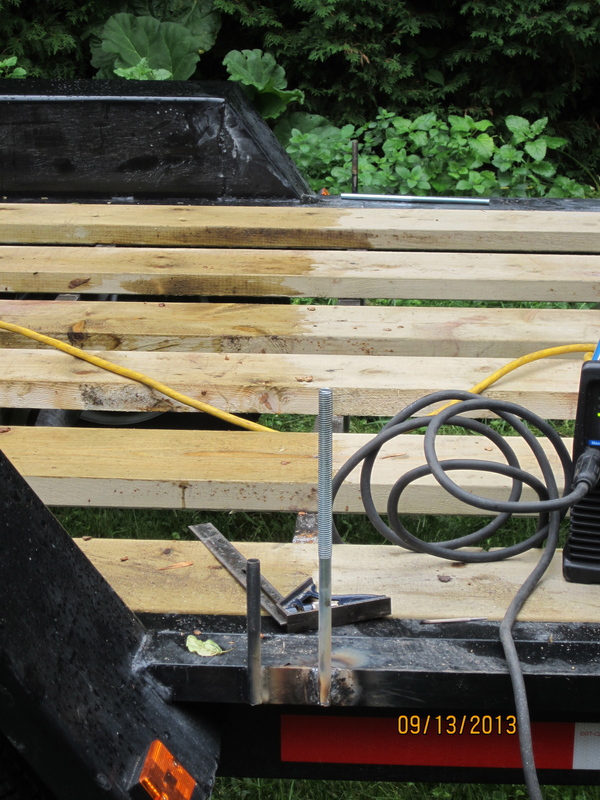 Mike also has amazing toys or tools, call them what you will, a contractor’s circular saw is a beautiful thing. 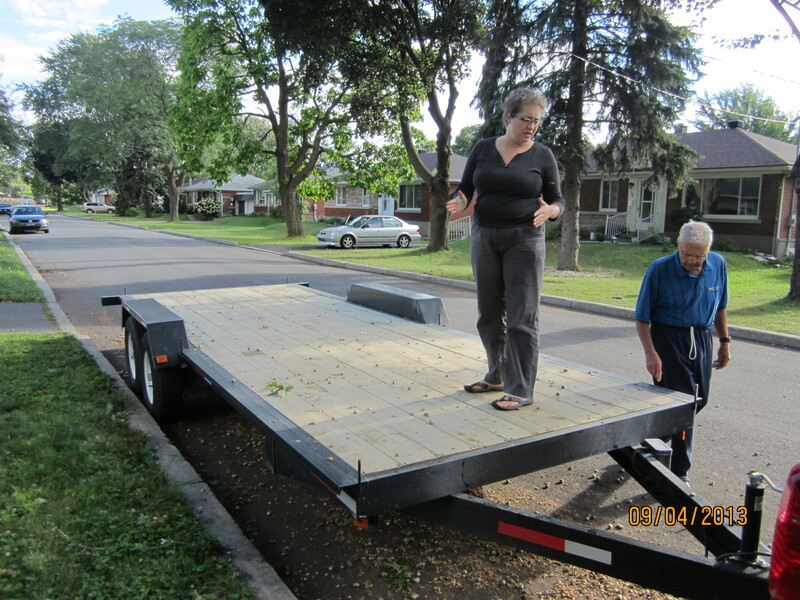 With Mike’s help we relevelled the trailer, and magically the subfloor was pretty much complete, if it hadn’t been for my purchasing one too few sheets of 3/4 plywood, the subfloor would be finished right now. 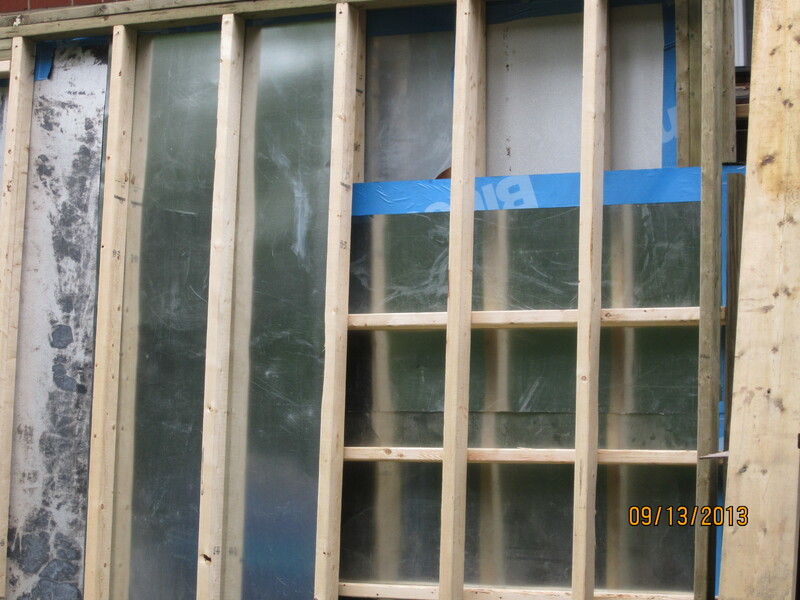 As it stands, a quick trip to the hardware store and a rummage through their off cuts and my subfloor will be done tomorrow and the process of starting the wall framing can begin. 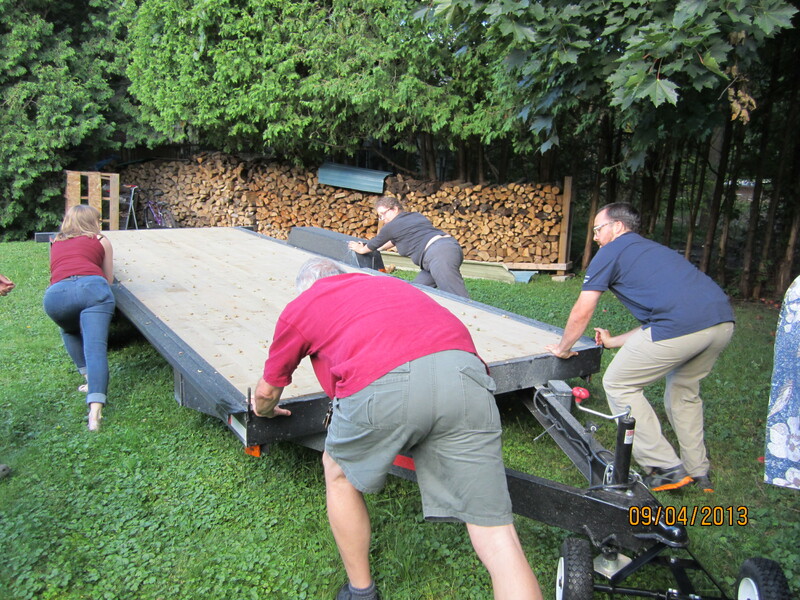 The trailer with all the rods on and one of the last times we will see all of the frame. 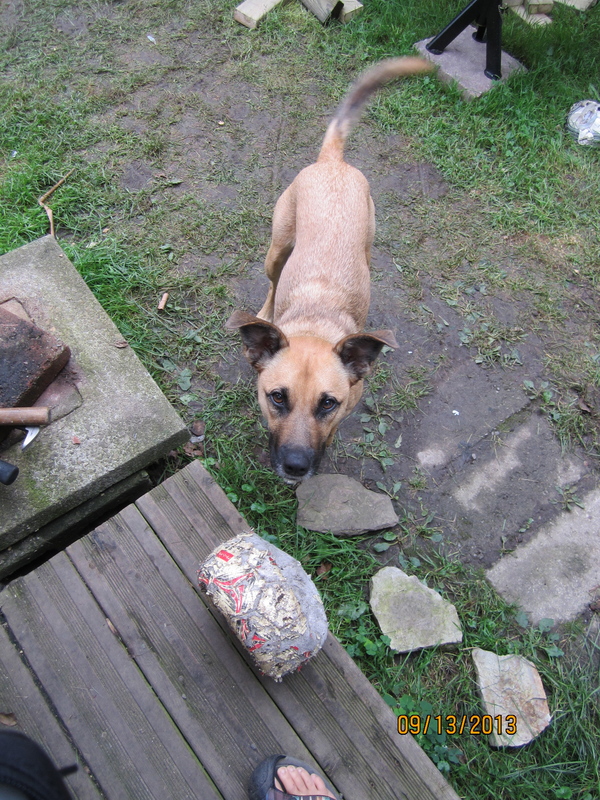 Clover’s idea of helping with the build is to bring you a ball. She is so very helpful. Me showing my best side! Before covering up the trailer I used a grinder to remove some of the rusty metal shavings from the holes drilled to attach the boards to the trailer. After the rust was removed, my dad spray panted the now unpainted metal to protect it. 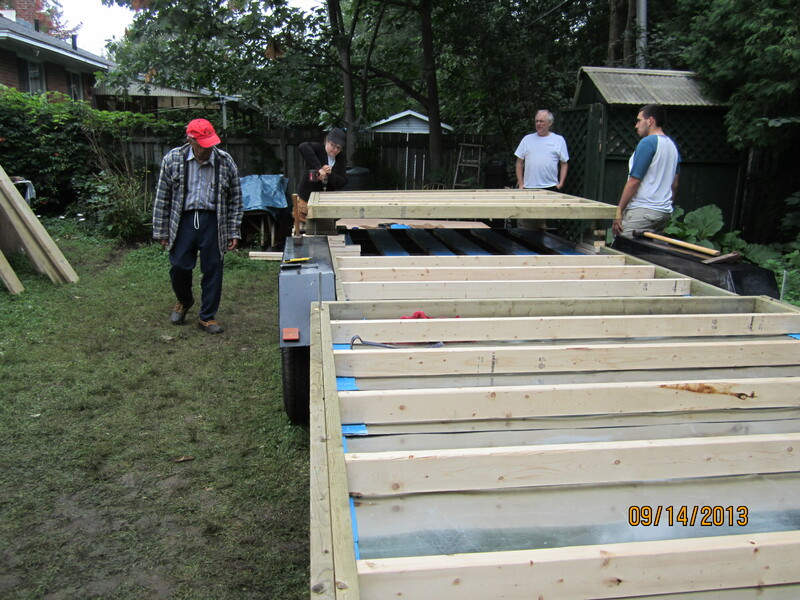 My cousin Alex and raising the subfloor up over the rods so that the holes could be drilled for the rods to fit through. Drilling holes for the rods. 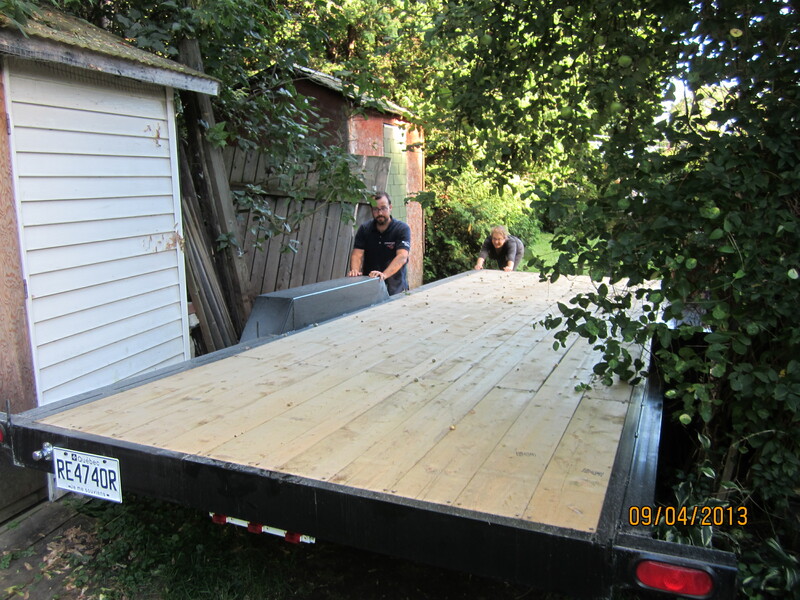 Jump to an insulated, relevelled trailer and the first piece of plywood going in place. Look at that subfloor! It’s beauty is only enhanced by the last of the beer I brought back from PEI. My goal for these first two weeks of construction is to get the subfloor done. 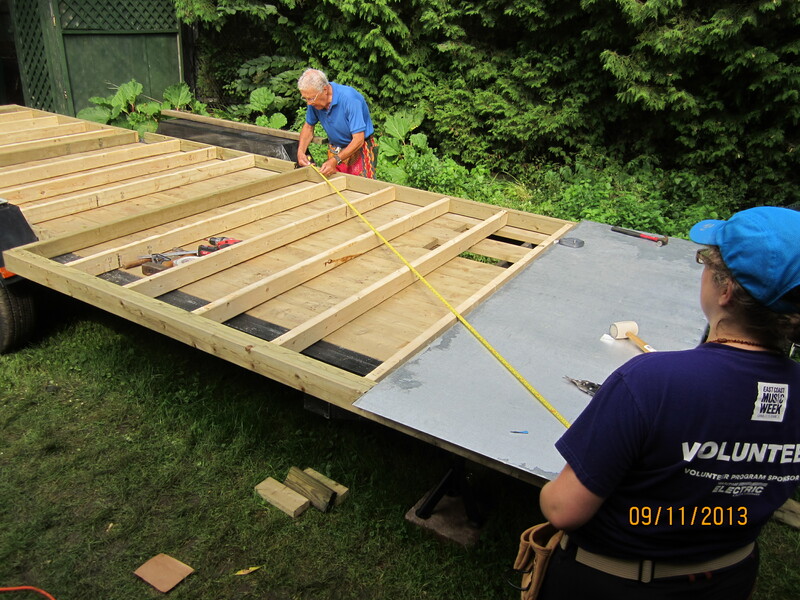 For a while, I had hoped that maybe I could get some walls up, but I think it’s going to be a completed subfloor. 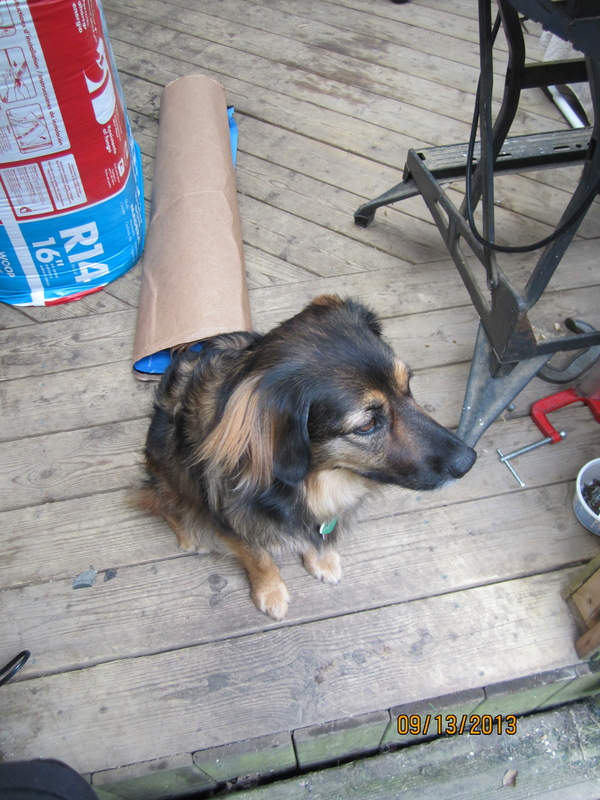 I am not working as many hours every day as I had hoped, as I cannot work alone during this stage of the build. 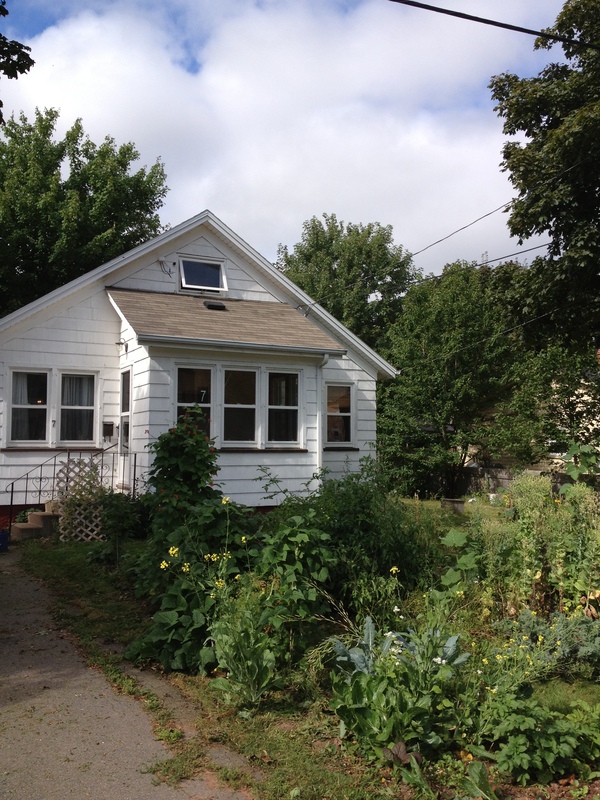 Turning over sections of the subfloor alone just isn’t feasible. So my schedule is restricted, nonetheless, construction is moving forward. Today, most of the flashing is done, we had to stop working on the trailer as thunder rumbled in the distance (didn’t feel wise to work with metal when there was thunder for some reason) and I had to go and by an extra piece of the galvanized flashing I am using, as I miscalculated when I first purchased the flashing. In the end the slow pace is working out well. Every morning my father and I bring in a set of realizations that help us move forward. 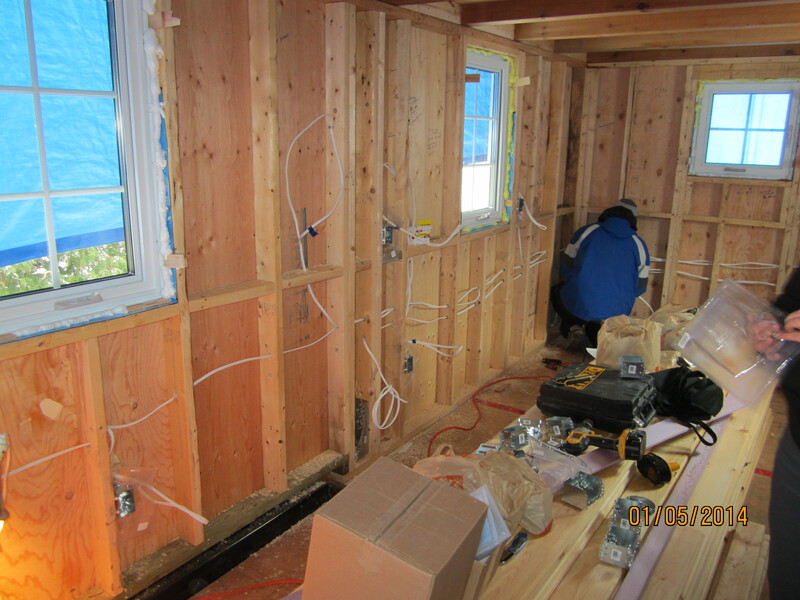 This morning our realizations had to do with wrapping the flashing up the edges of the framing of the subfloor. My original plan of folding the flashing over the edges of the framing didn’t work well with the flashing I ended up buying. 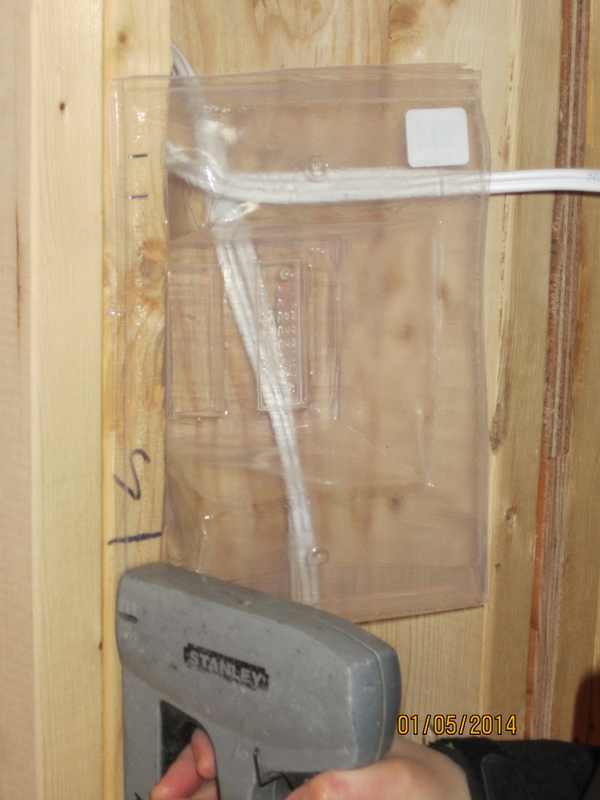 Most of what I have read recommends aluminum flashing for the underside of the subfloor. 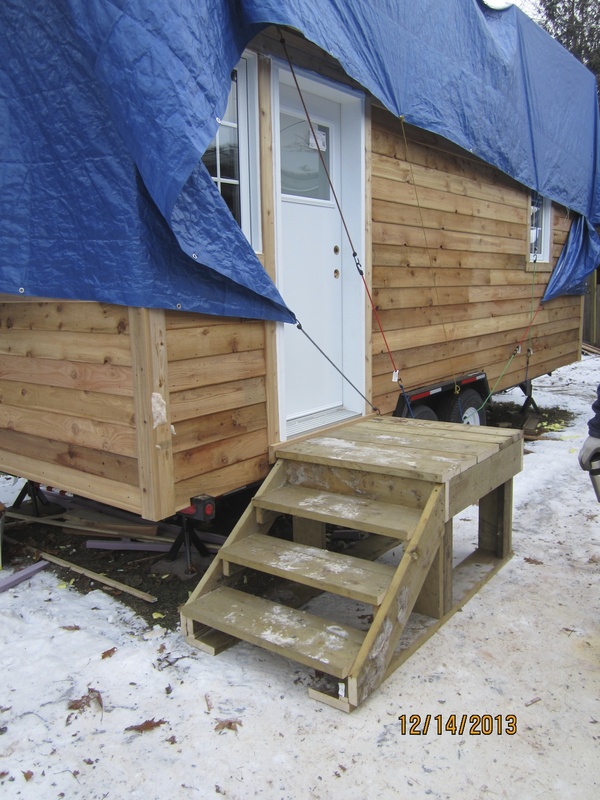 The decking of my trailer and the wood I am using on the outer edges of the subfloor are pressure treated, and the chemicals used in pressure treating the wood can react with aluminum. 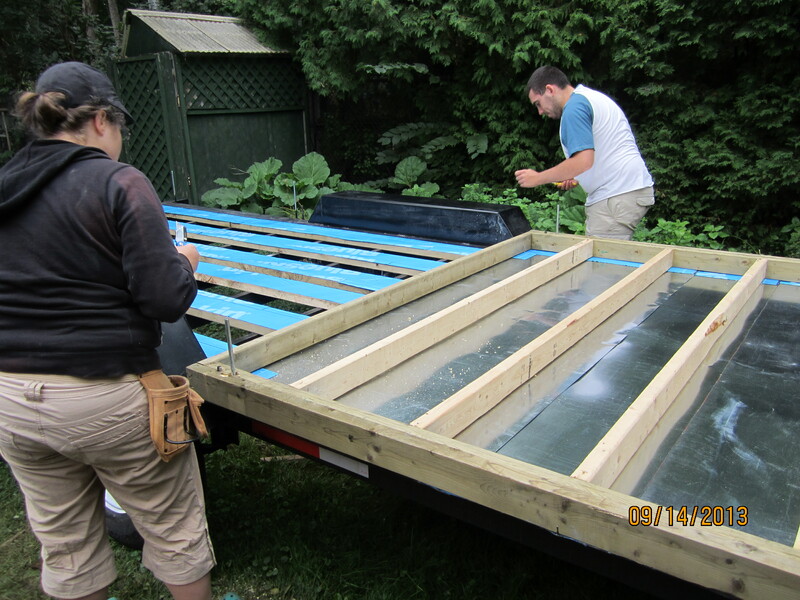 So I am going with galvanized flashing (I would tell you the metal that has been galvanized if I knew what kind of metal it is). 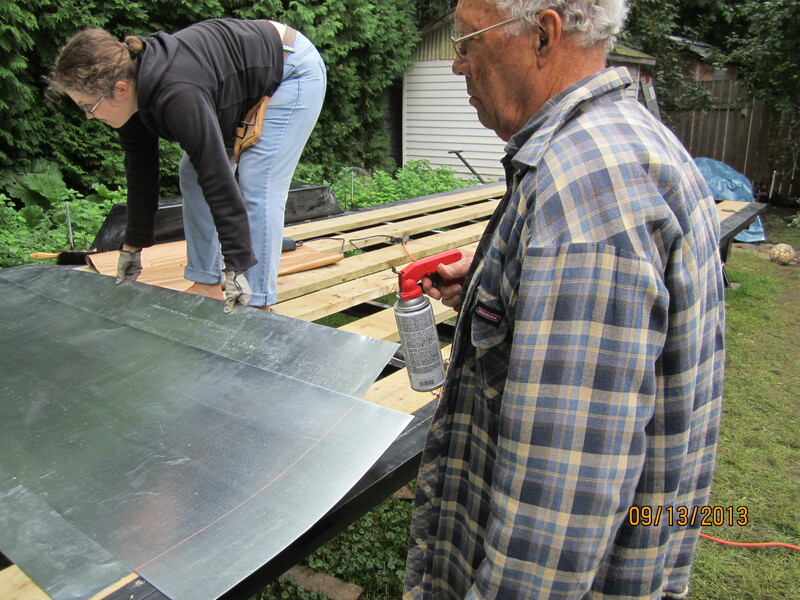 The galvanized flashing that I was able to get is much thicker than the aluminum flashing and possibly also less flexible than aluminum, so wrapping it over the edges of the subfloor was far from pretty and left space for water to well in, so today all of the excess flashing was cut off. 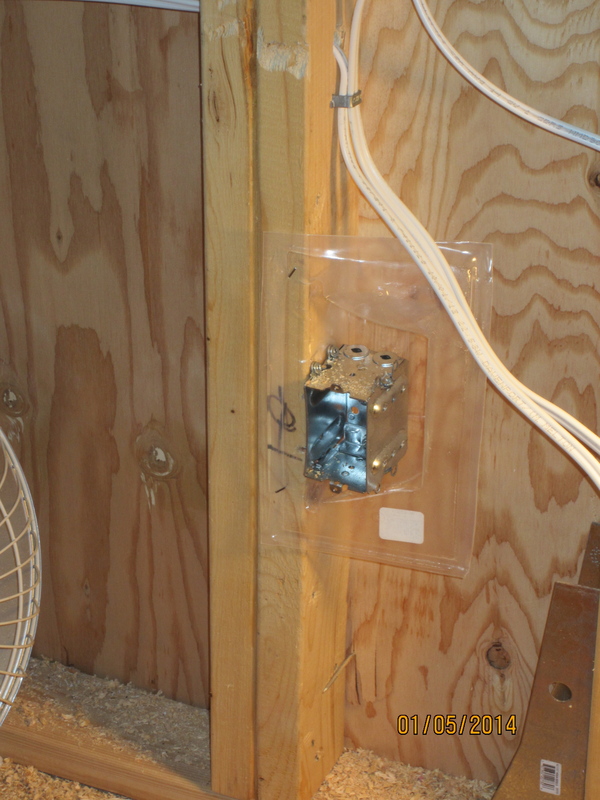 I am also using a product by Bakor called Blueskin WP 200, to seal the seams of the flashing and I am being possibly a little extra cautious and am using it wherever the flashing comes into contact with the pressure treated wood. Possibly overkill, on the other hand, this is a section of the house that will not be easy to go back and redo once I am further along and I want to prevent as much corrosion as I can. 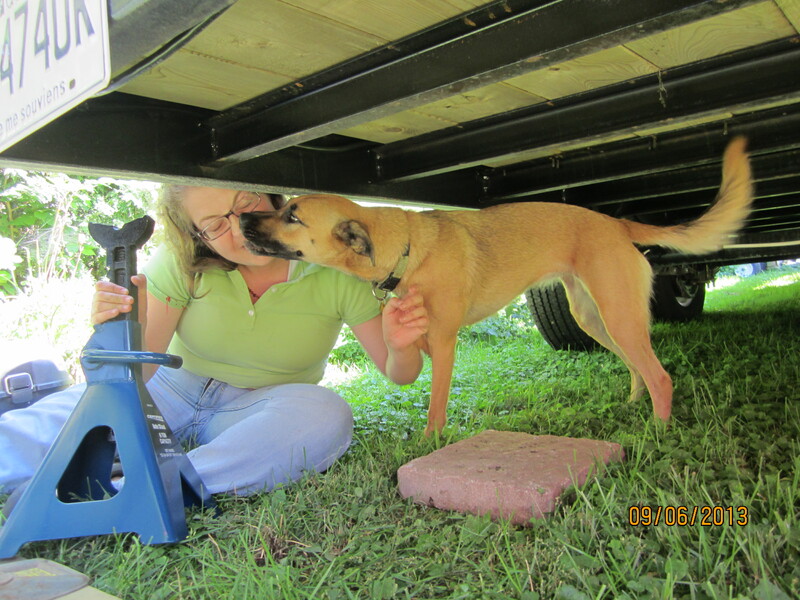 Tomorrow, a welder comes to add extra threaded rods to my trailer, as the rods that are already welded onto my trailer are not long enough. 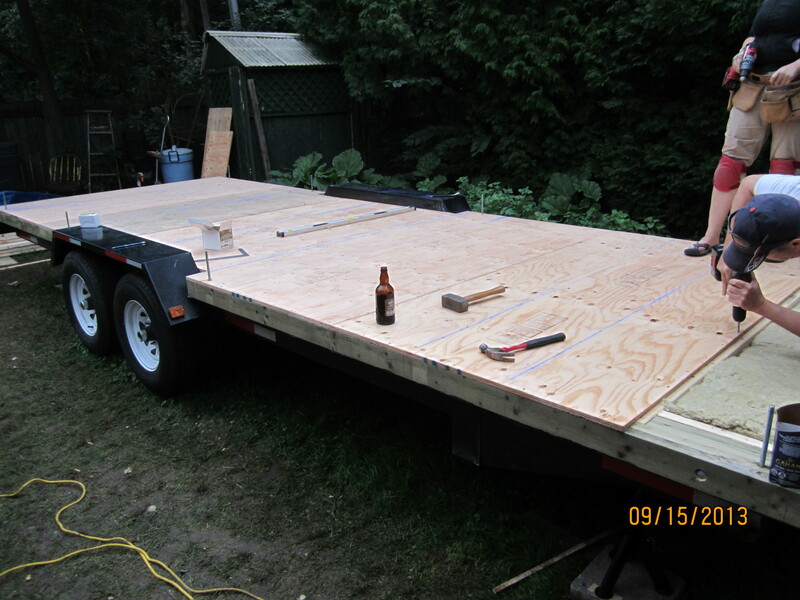 Once the new rods are welded on, we can drill new holes in the sublfoor, set the 3 sections of the subfloor onto the trailer right-side up and move onto insulating and covering the whole thing up with plywood. 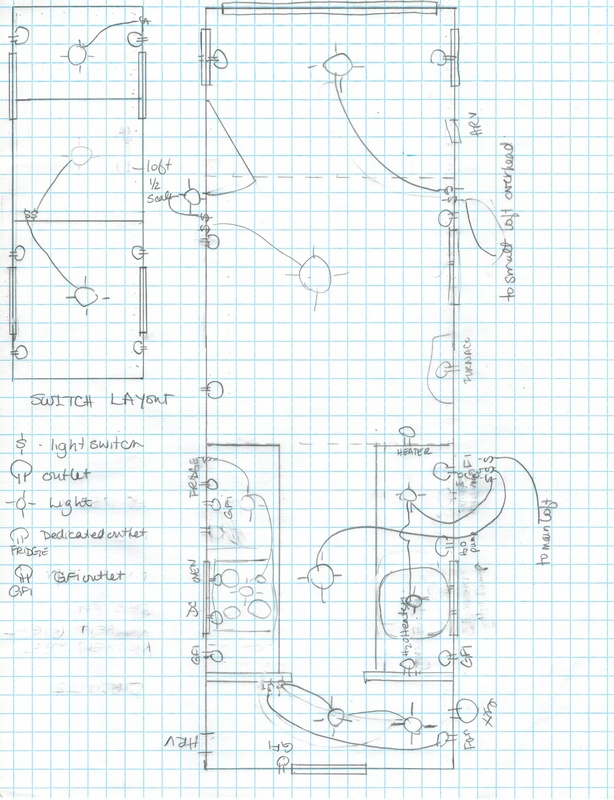 Then it’s onto framing the walls and I have to decide exactly where my door will be. We are getting the first piece of flashing on. 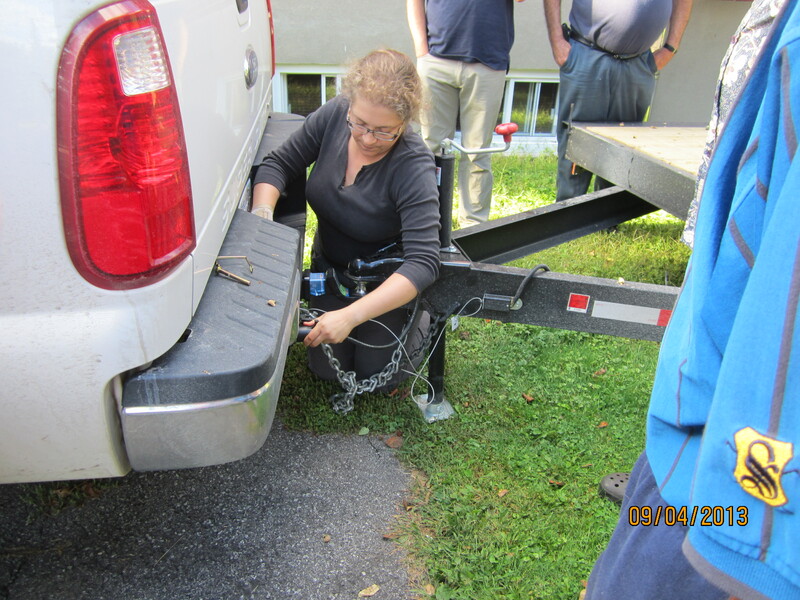 The first piece should have been the last one to go on as you should start at the other end of the trailer so that when your trailer is on the road water the seams of the flashing do not encourage water to get in. So we put this piece on and started again at the other end. 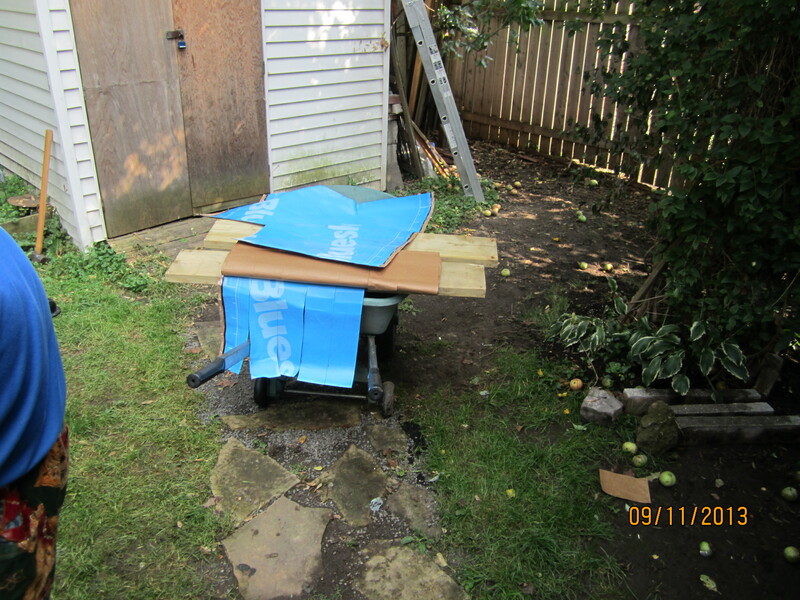 This is one view of the Blueskin all cut up and ready to edge the flashing. 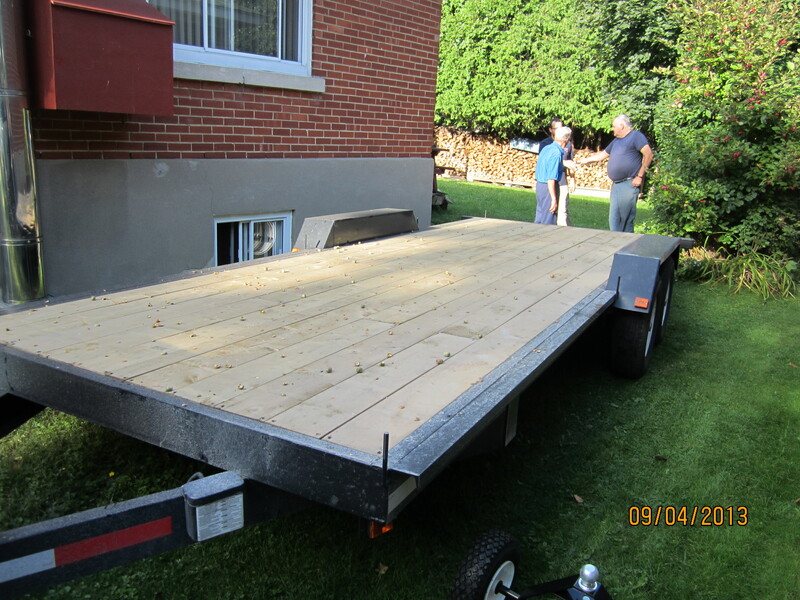 My trailer is ready and registered and Tuesday I pick it up and bring it back to Montreal. Getting ready for the trailer is its own adventure. 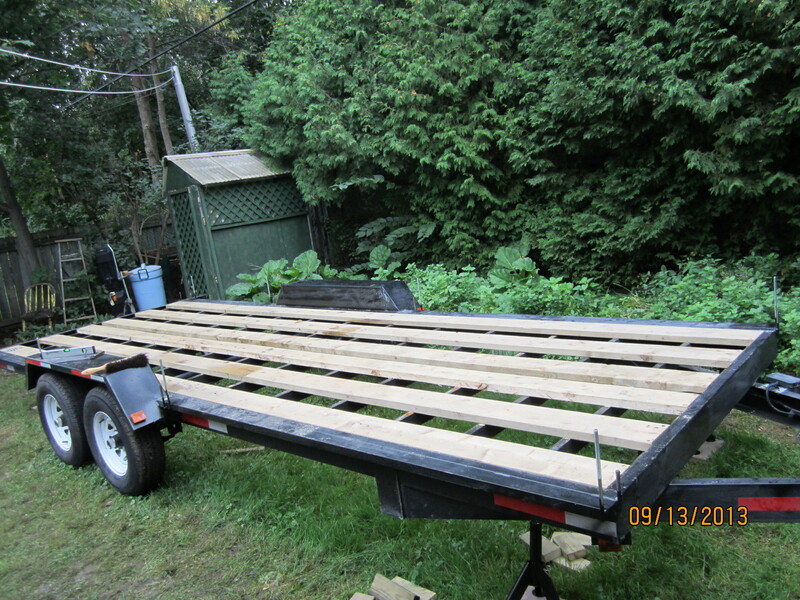 I bought a trailer dolly, jacks, registered my trailer, have arranged to have the path to my construction site cleared and ready for the trailer to be moved in. 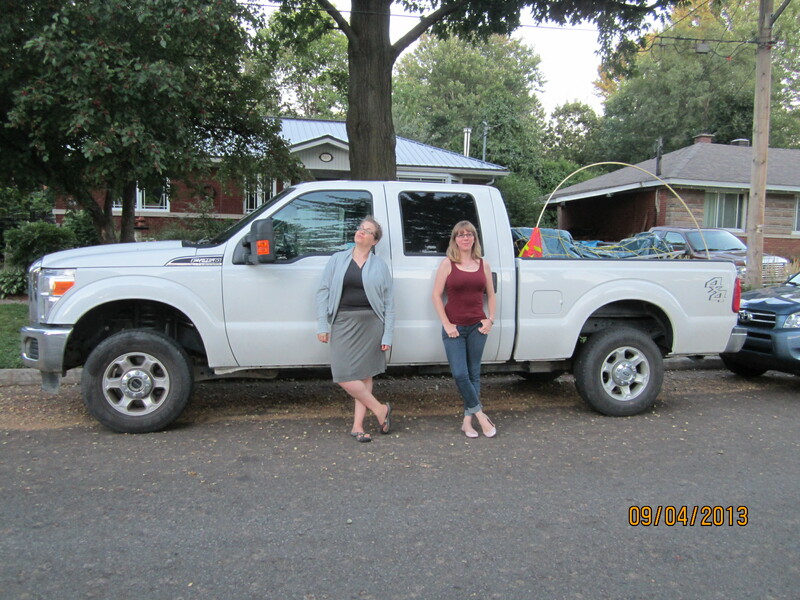 I have read about backing up trailers and rented a truck. My trailer needs a 2 5⧸16 ball on the hitch. I bought my own trailer hitch, I know that I will need a hitch again in the future and now I won’t have to worry about having the hitch work with the trailer. 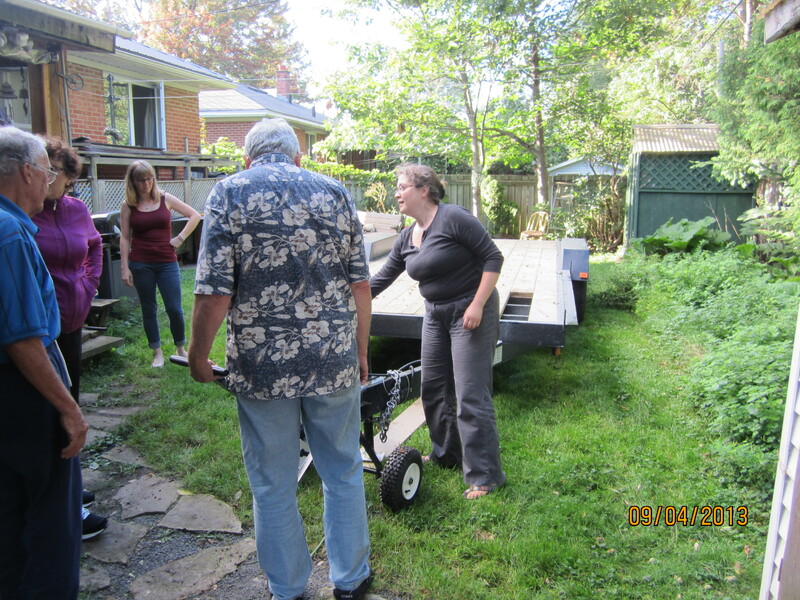 A bonus – the hitches were on sale at Canadian Tire. The truck is actually hilarious. 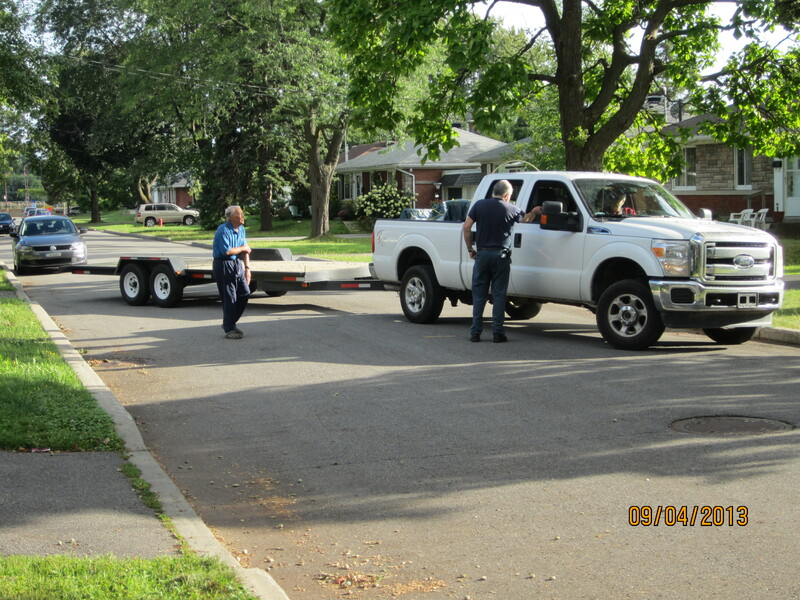 It is far bigger than I need to tow the trailer back to Montreal, but it’s all the rental company had that accepts a trailer hitch. 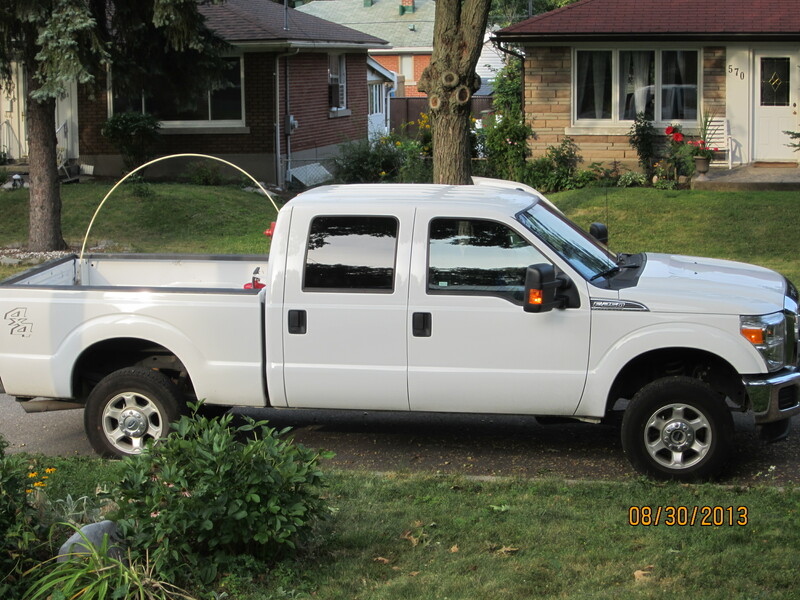 My 5’5″ self is driving a Super Duty Ford truck, with a huge antenna on the back. During the drive to PEI we were higher up than all of the other pick up trucks. 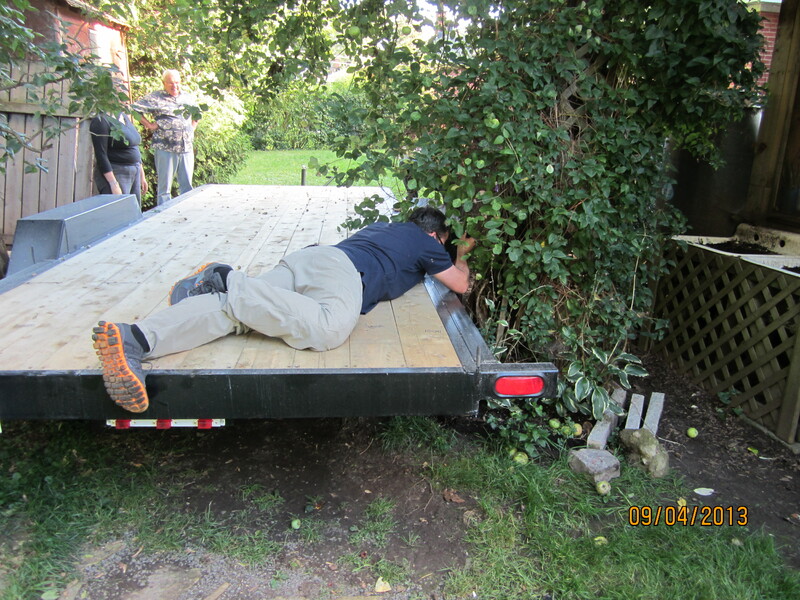 While packing the truck for the trip from Montreal to PEI, I went to step out of the back seat, misjudged the distance to the ground and ended falling out of the truck. I didn’t hurt myself, but find myself on my back with my legs up in the air, one shoe went flying into the bushes behind me. It was pretty funny. 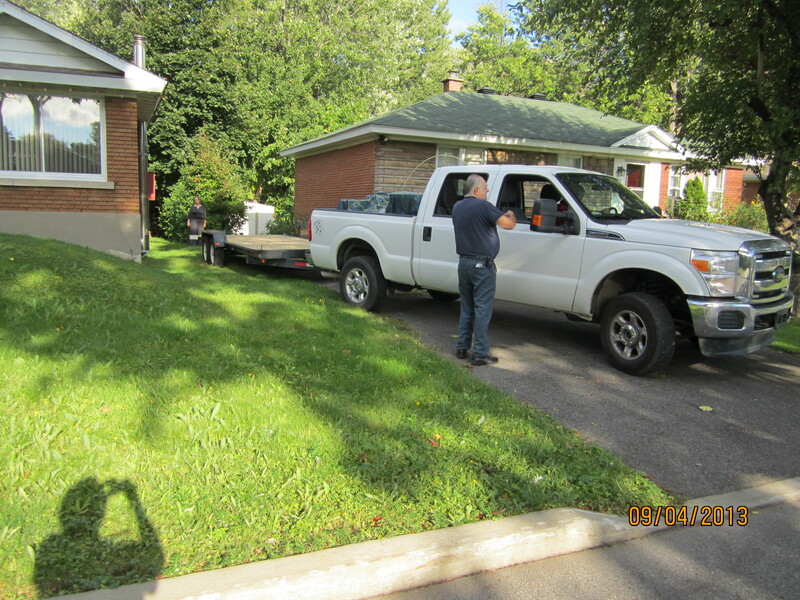 So a word of warning to those who are considering renting a truck to move your tiny home, if you get a Super Duty Ford, the distance to the ground may be greater than you think. 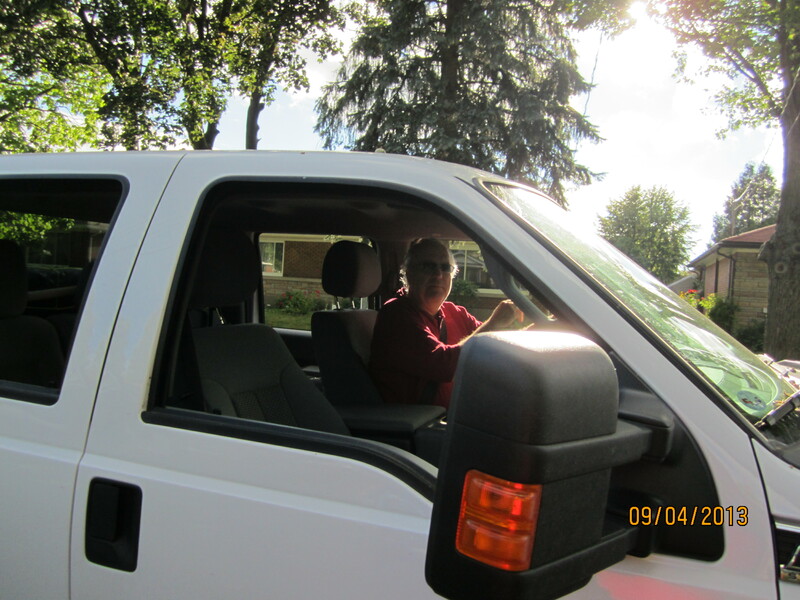 My Super Duty Pick Up truck!